THE world of beauty pageants has helped two disabled sisters find their confidence and, for one of them, her first words. From a young age, both Ava and Jessa struggled with their confidence, with Jessa unable to speak at all. 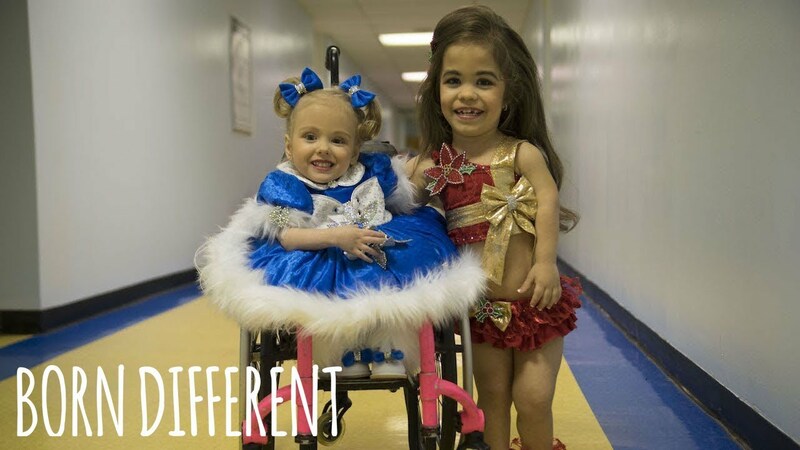 Ava was born with achondroplasia, the most common form of dwarfism, and Jessa has spina bifida milamidiseal - one of the most complex forms of spina bifida. Parents Jacqueline and Jason Whipple turned to beauty pageants to see if they could bring the girls out of their shells. Between them, Ava and Jessa have appeared in 40 beauty pageants, winning several crowns along the way, not to mention the hearts of everyone who meets them - and their parents couldn’t be prouder. Jacqueline said: “We’re succeeding at our goal. We wanted to change the face of beauty and change people’s perceptions. I love watching them on stage. I love watching them succeed. I love watching them be proud of themselves." The Whipples, from South Carolina, always knew that they wanted a big family, so they decided to adopt. Ten years later, the couple has four children with disabilities, including 10-year-old Brady, 4-year-olds Corbin and Jessa, and 9-year-old Ava. Jason Whipple told Barcroft TV: “For various reasons, my injury primary among them, we couldn’t have children naturally, but we wanted to have a family. So we started to look for adoption. Jacqueline said: “When I was in the process of bringing Ava home from Bulgaria, the only thing I could do to feel connected to her was buy things for her for to have when she got home. Despite his initial reservations, Jason has since embraced the pageant world and credits it with transforming both girls’ confidence. He said: “I’m gonna be honest when Jackie told me she wanted to get the girls involved in pageants, I was not on board. “I had seen all these shows, 'Toddlers and Tiaras', and heard all the nightmare horror stories and I didn’t want that for my girls. But, I wanted Jackie to be happy and I wanted my girls to be happy, so I said ‘okay, one pageant’. Jacqueline added: “When we started pageants Jessa didn’t talk at all - she was nonverbal. She was doing speech therapy weekly, we didn’t know if she was ever gonna talk, we had hope but we didn’t know. Ava said: “I like to model and being on the stage and seeing everybody and everybody seeing me. Pageant director Tonya Taylor has made sure that the girls compete alongside their peers at every stage of the competition. Tonya said: “I saw them first perform at one of my pageants and I thought that Ava, of course, was a firecracker, and Jessa is a complete sweetheart. “Overall, I think the girls are absolutely amazing. They’re different but you wouldn’t know that from them. “That was my biggest thing, I want them to come but I want her to compete in the regular age groups. I’m not going to make it a handicapped age group just for your girls, they know they’re different, so why not let them meet friends and compete with the best of the best. At their last pageant, Ava and Jessa won several crowns and titles, including Division Best Hair and Outfit of Choice, Elite Surpeme and Miss Originality. Jason said: “Ava struggles with self esteem issues, she struggles with thinking that I’m valuable. Obviously, we know that this came from her first three and a half years in an orphanage, so this has really helped her find her value, her self-worth.